This should be obvious, but it needs to be permanent. A number of anime kill off certain characters, and it can be very tragic, but then they come right back to life later on, by whatever means. It can be well done, and powerful, but still… the saddest of partings is the one which has no promise of reunion. So, no one from the Dragonball franchise. Which goes into another thing: it needs to matter, not just to the characters but to us, the audience. Simply telling one character’s story and how they lose or lost someone we barely know… yes, we can understand why it matters to the character, but the more we can feel alongside them, the better. 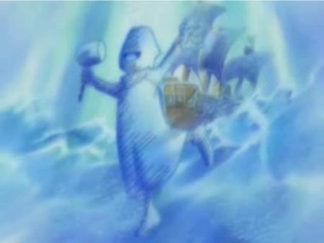 Alas, this disqualifies Bellemere from One Piece, whom I really like as a character. Also, this is “saddest death,” not “most horrifying demise,” so massive slaughters, or sudden, surprising, horrific fatalities, or even when they can be put down as just another person dying… these do not count. Too much “shock,” not enough “sorrow.” Thus, as intense as the deaths in Attack on Titan are, they are not quite what I am looking for. Finally, and I think this is the one that’s decided it for me: there needs to be more than just sorrow. I’m a big fan of the bittersweet. When a loved one dies, the pain is unavoidable, and it’s unhealthy to try, but there should also be gratitude for the time we’ve spent together, and a gladness that they were alive. In short, alongside sadness, there should be hope. That may seem counter to what I just said about the parting being permanent, but without some solace, sorrow will sink us into despair, and I hate the thought of leaving anyone trapped in such darkness, even for a moment. So, while Maes Hughes from Fullmetal Alchemist is a strong candidate in his own right, I must regretfully pass him by. For one thing, obviously, she’s a ship. And not one that is “alive” from the get-go. Merry, as they call her, was given to Luffy and his crew just when they were setting out on their adventures, in thanks for saving a village, and one innocent life in particular, from a cold-hearted pirate’s lethal machinations. 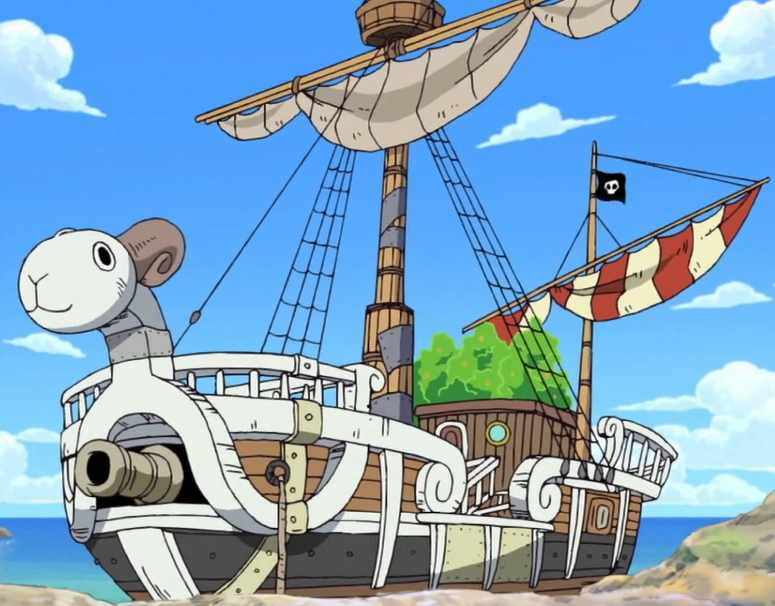 Then, for nearly three hundred episodes, she carried the Straw Hat Pirates across strange and treacherous seas, through zany, crazy adventures, and truly dangerous perils. She even flew on more than one occasion, which ships are just not normally designed for! In short, she got really banged up over a long series of events. Usopp was easily the most attached to Merry, right from the beginning, being a present from his own dear friends whom he grew up with. He tried to take care of Merry, repair the damage she suffered, but he wasn’t very good at it. Her crew wasn’t exactly gentle and restrained, and they damaged her more than a little, all on their own. But they did their best. They weren’t very good at it, but they loved her. She was their home, their constant, silent friend and protector. On every inch of her, they laughed, cried, shouted, felt fear, ate, slept, were bruised and healed… all the things of life. So it’s no surprise that she took on a certain life of her own. The seas are vast and filled with wonders… and mysteries. And some things which are both wonderful and mysterious. Among them is a certain specter, said to be the spirit of a ship well-loved. It can appear in the darkness and mist, making repairs to its body, that it might carry its crew just a little further, just a little further. Usopp himself has a ghostly experience with this one night, though no one really believes that he saw such a specter, at least not at first. 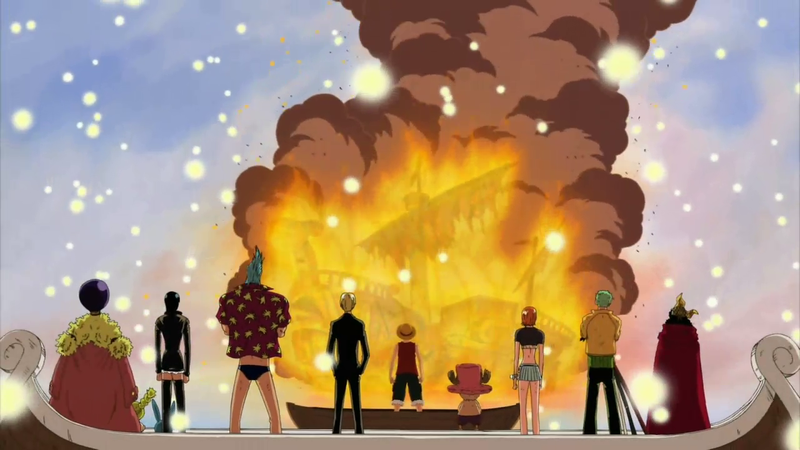 Thus, when Nami reserves most of a substantial fortune they’ve “stolen” (from people who didn’t want it anyway) to hire some professional shipwrights to fix Merry up properly, no one disagrees in the slightest. In fact, they’re excited for it! But then they learn the terrible truth: Merry has taken a wound the likes of which no ship can ever recover from. It’s a miracle she’s holding together at all, because she’s a floating wreck, dangerously close to coming apart at any moment. Merry is dying, and she can’t be saved. She’s not even dead yet, and her crew has to face the loss of her already. Usopp tries not to, and it explodes into this big fight where deeply hurtful things are said and done. He keeps fighting to try and save her, to try and change reality, but he can’t. When villains kidnap his friends and send Merry to her apparent doom without him, Usopp’s anger and sorrow is all but unequaled. Then there’s an entire story arch where we don’t see her… until she miraculously appears, just where she’s needed, just in time to save her crew. And with her very last breath, she takes them to safety. The moment that safety is achieved… she breaks. Almost in two. By now, everyone, even Usopp, has had time to accept reality. Their dear friend, their ship, is done for. All they can do now is keep her from the lonely darkness of the ocean floor, so they set afire to her. Her funeral and her final death are one and the same. As the they stand together, mourning her, they see… snow? Golden snow begins to fall in the middle of the sea, shining with the light of the fire. As it touches them, they see, once again, the good times, the happy memories that have made them a family, and which made Merry their home. And, at last… they hear her voice. All of them, even perfect strangers, hear the voice of the Going Merry. She is glad that she was with them, and could carry them. She’s sorry she couldn’t carry them further, and they all break down in tears, apologizing for how they failed to keep her in good condition. But they were all happy together, the ship and her crew. In short: she’s happy for the life she’s had. The permanent death of a dear friend the audience loves as much as the characters, set apart from any other death in the show, and a truly bittersweet experience, with sorrow and solace intermingling. 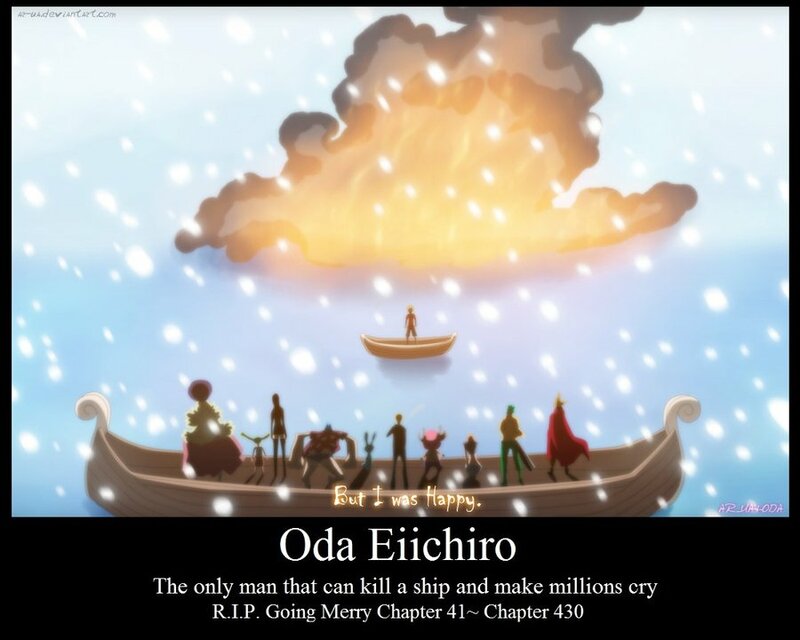 That is the death of the Going Merry. This entry was posted in 30-Day Anime Challenge, Anime and Cartoons, Challenge Accepted and tagged Going Merry, One Piece. Bookmark the permalink.